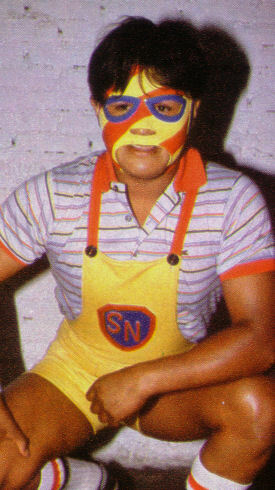 Loosely based on popular kids character El Chavo del Ocho (played by Chespirito), Super Niño was one of the rising stars of the Pavillón Azteca in the mid 80s. A local of Tampico, trained with Rey Neptuno, who was his opponent during most of his rookie years, even though his debut was on October of 1984 teaming with Super Muñeco against Lobo Vikingo and Ricky Boy. A crazy flyer for his era, he was another in the long list of characters that vanished after the glory days of Pavillón, even though he even made it to El Toreo on April 7, 1985. This page was last edited on 22 June 2017, at 16:55.